1. Spread tortilla with dijon mustard. Sprinkle with cheddar cheese, green onions and coriander or parsley. Fold in half. Cover with plastic wrap. Microwave for 20 to 25 seconds. Or heat in a skillet, turning once. Remove plastic wrap and slice into 4 wedges and serve with salsa. 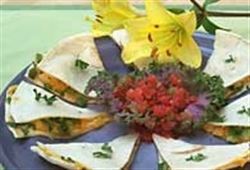 Enjoy this delicious quesadillas Mexican recipe!